Hey there, everyone! Welcome to another day of the July release for Lil' Inker Designs!! I hope you've enjoyed my cards so far! For today's card I went super clean & simple and created this one layer card using one of the newest stamp sets. I also created this using the CAS-ual Fridays challenge #134. I chose the elements of sequins/white/dots from the bingo card! 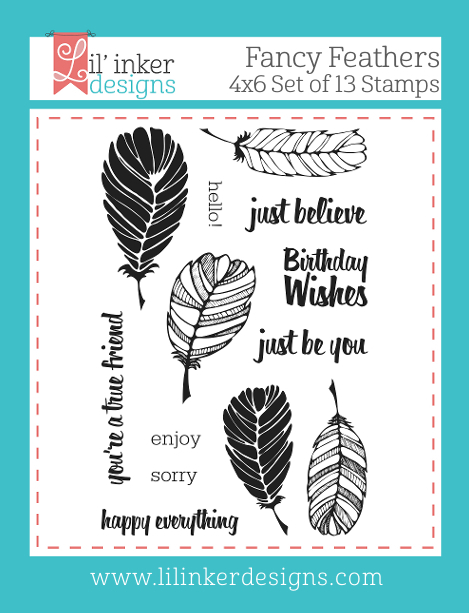 I used the new Fancy Feathers stamps set, and masked off the word sorry to create the sentiment. I combined the stamps with just some gold mist, gold sequins & enamel dots. 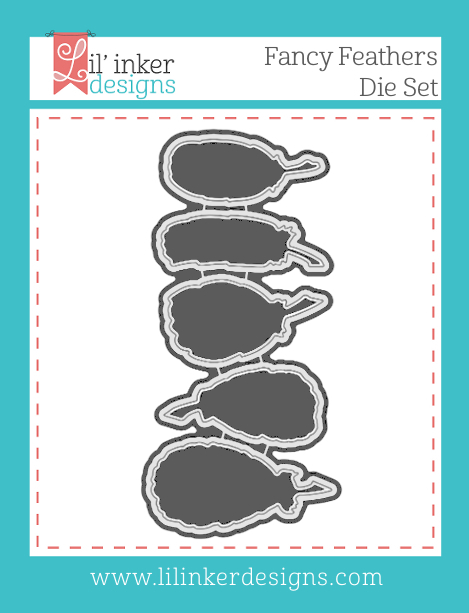 There is also a coordinating Fancy Feathers die set for the stamps...I didn't use it for this card, but will definitely be doing so in the near future! My card was really easy to whip together, and can easily slip into an envelope to send out to someone either as a sympathy or apology card. Pretty card! The feather stamps are awesome! LOVE the ELEGANT design, the feather and clever masking for the sentiment work perfectly with the misting & sequins - LOVE IT ALL!!! perfect sympathy card. not too flashy. clean and thoughtful. What a great card. I love the just stamped outline of the feather. Wow...clean and simple perfection! Just lovely!!! Very nice CAS card! Elegant and understated. Fab CAS card. Love the sequins. Great cascade look using the pretty feather stamp. Simple but striking! The feather design really shines. So CAS but so elegant! Love everything about this clean and simple card! thanks for sharing! Simple and yet such a beautiful card. Very nice heartfelt card. Simply stated. I like the CAS design and the touch of gold. Very pretty Lea. Love the gold accents. So, so beautiful!!! Love your work! This simple card expresses the sentiment elegantly. I love the simplicity of this card. So perfect for the sentiment. Love the Fancy Feathers! Your card is very elegant and I love how you kept it simple but added just a touch of bling to sparkle it up. Wow. Such a beautiful and simple card. Love the way the gold pops against the white and black. Love the super-CAS-ness of this! 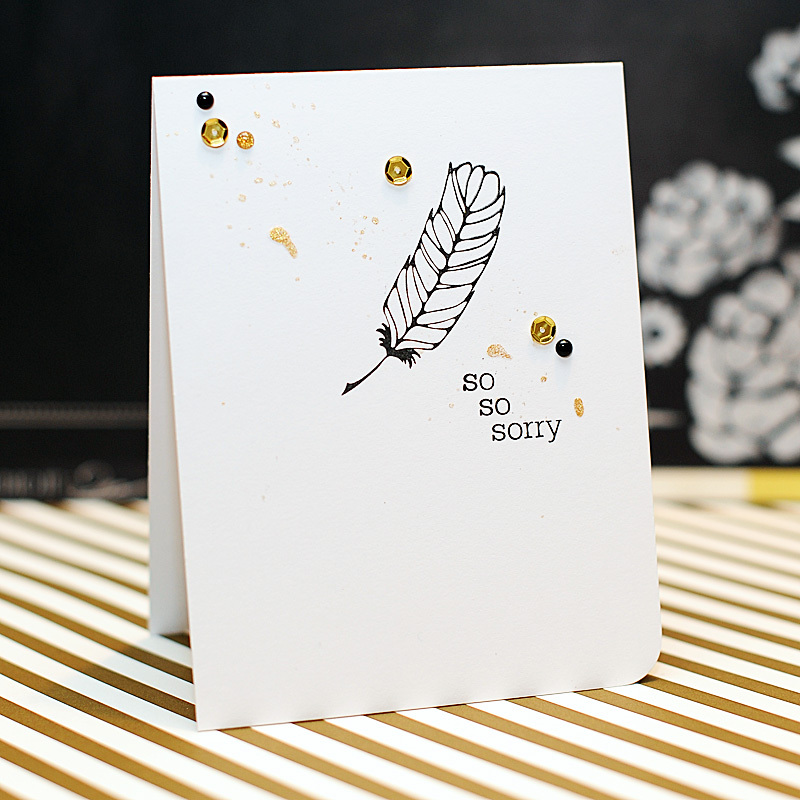 The floating feather feels wistful and is perfect with that sentiment! So glad you joined us at CAS-ual Fridays! beautiful! Such a striking card! Very pretty card. Great color combo on this! Thanks for playing along with us over at the CAS-ual Fridays Tic Tac Toe Challenge! Love this CAS design and your creative sentiment! Thanks for joining CASual Fridays challenge! OMG, I am madly in love with this CAS card, which is saying a TON since it's a card for a sad occasion. Each element is just right, down to the rounded bottom-right corner. Thanks so much for joining the CAS-ual Fridays Challenge, Lea!